Impress your friends and family with these interesting facts about one of the most famous national parks in the world. 1. Chobe National Park is divided into four different areas, each with distinctly unique geographical landscapes. They are as follows; the Savuti channel, Linyati wetlands, Serondella and Nogatsaa. 3. The roads in Savuti are notoriously difficult to drive through due to the wet black cotton soil in the area. All the more reason to take a digital detox and enjoy the simple pleasures of a Botswana safari. 6. In the 1940’s, Chobe National Park fell under a major tsetse fly infestation. This has a great impact on the decision to declare the area a national park. They are mostly paintings of livestock. This area is known for its wandering leopards. See more here. The Great Elephant Census of 2016 conducted a large study of African elephants on the continent. Of their findings, Chobe National Park had the highest concentration of elephants out of 18 other countries. The news article stated that...The newlyweds, who had hit headlines throughout their turbulent first marriage of nearly 10 years, retook their vows at Chobe National Park in Botswana. The ceremony was conducted by African district commissioner Abrose Masalila. 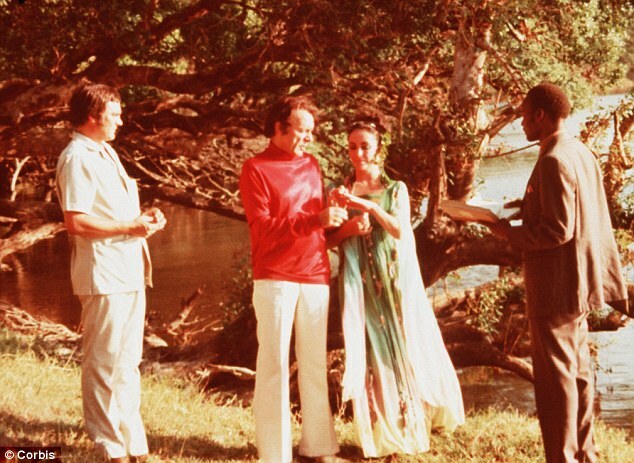 The service lasted 20 minutes and took place in Mr Masalila's office in the village of Kasane, with Taylor wearing a green dress with lace frills and guinea fowl feathers, and Burton in a red shirt and white trousers. 10. Victoria Falls is only a short drive away from the park. Don’t miss the chance to visit this magnificent feat of nature on your Botswana safari. You can see rhino at the Khama Rhino Sanctuary, Mashatu Game Reserve and Mokolodi Nature Reserve.